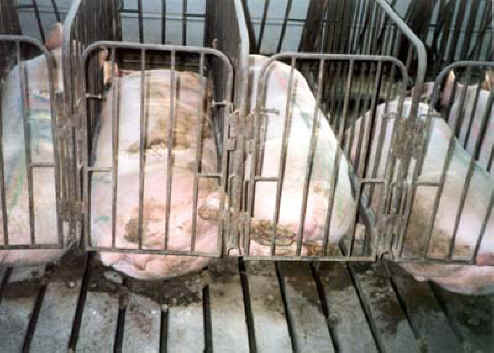 (Pig Exploitation - Gestation Crates - 01) There is no liberty, or freedom, or joy for farmed pigs; there is only misery from the day they are born to the day they die. Female pigs used for breeding (called 'breeding sows' by industry) are confined most of their lives in 'gestation crates' which are so small that they cannot even turn around. The pigs' basic needs are denied, and they experience severe physical and psychological disorders. They don't even have enough room to lie down in a comfortable position.